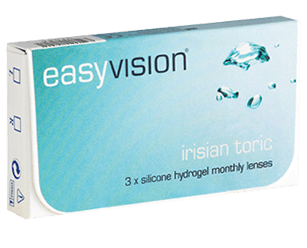 easyvision monthly irisian toric lenses offer outstanding value as they are reusable and correct astigmatism. 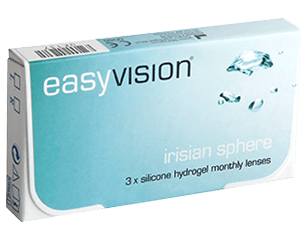 These lenses benefit from a handling tint and silicone hydrogel material. This advanced material allows extra oxygen to the eye making the lenses comfortable throughout the day and healthy to wear. €20 per month (1 pair) by direct debit. (Minimum purchase 3 months, solutions €6.50 extra per month.) Available exclusively in-store. Free glasses with contact lenses: Cannot be used with other offers or exchanged in part or whole for cash. Initial 3-month payment required from new easycare direct debit customers. One free pair of £45 range glasses with scratch-resistant single vision lenses every two years. Current prescription required. Alternatively, an eye test will be required at our standard charge. easycare benefits are redeemable only by named scheme member.